We made it! 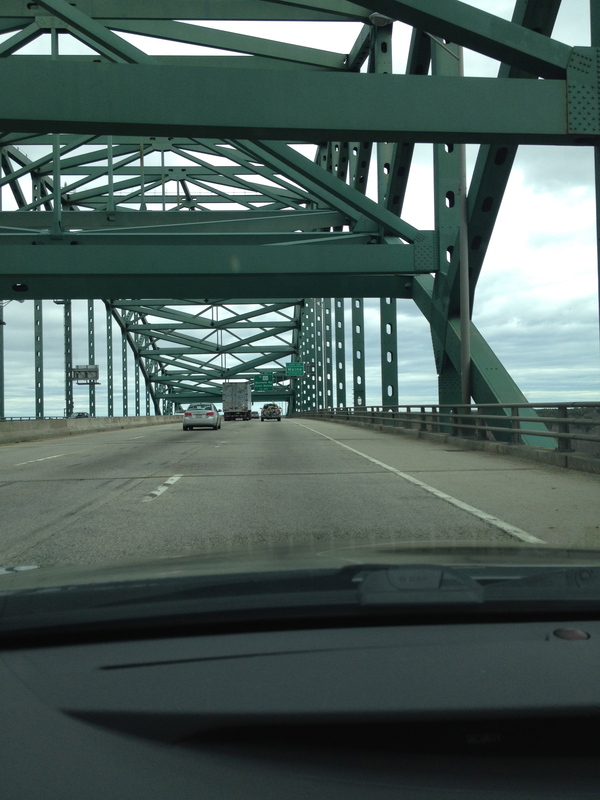 Four days of driving and we crossed the Piscataqua River Bridge for the first time with the knowledge that Maine is our home now. I’ll admit to getting teary-eyed at the thought of being home! When we got to the house yesterday, it was gray and drizzly but a balmy 54 degrees. It was colder in the house than outside but once the wood stove was blazing, we were all warm and comfy! 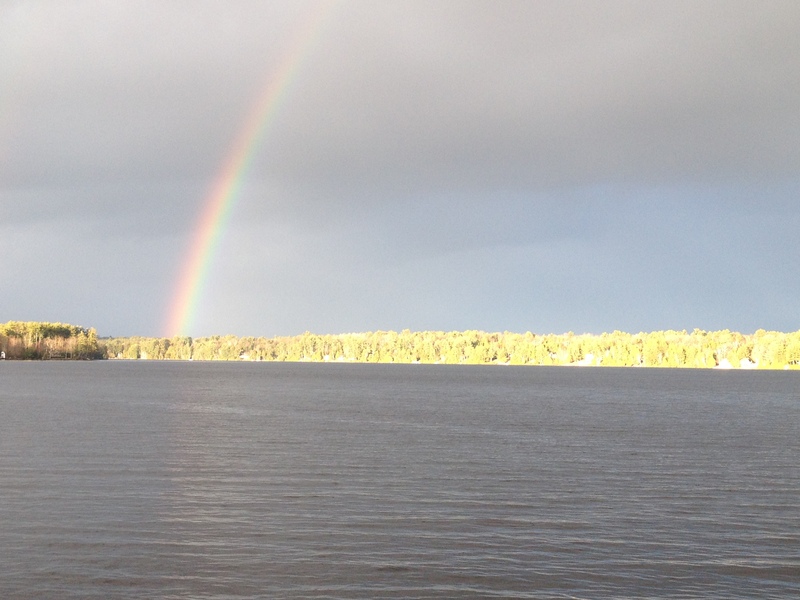 After a few hours, the sun came out on the other side of the lake and there was a beautiful rainbow to welcome us home. I’m not going to chronicle the rest of our trip up other than to say it was long. 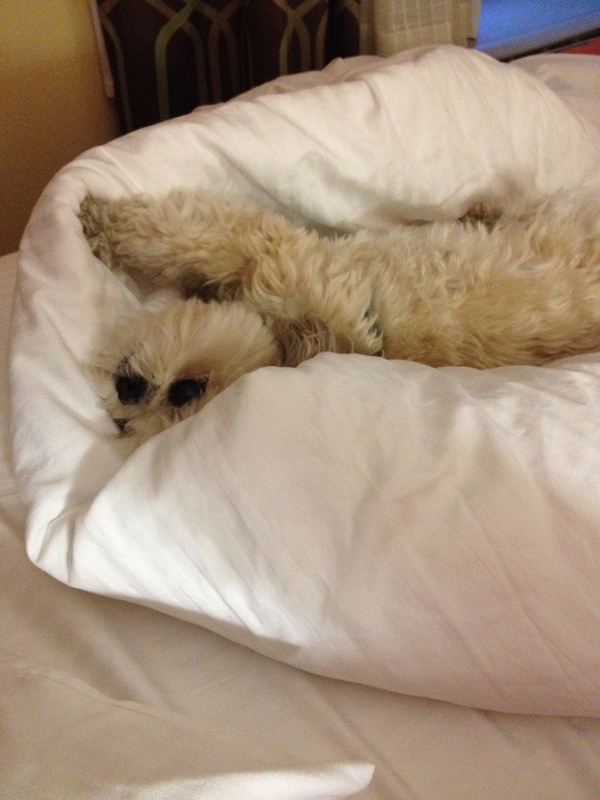 Boq enjoyed the fluffy hotel sheets and we all enjoyed getting out of the car for awhile each night. Our last night on the road was spent in Westport, CT with my college roommate. We had dinner at the Duck in Westport where it’s rumored that celebrities hang at the bar. We didn’t see anybody famous but it was an interesting experience … and probably not a restaurant that we’ll run back to anytime soon. We just walked up to check out the guest house and it’s chilly up there! I’d better get knitting because I think we’re going to need warm clothes and afghans! The biggest question for me is, what will I store all my yarn in? The burners on the little kitchenette seem to work and the space really is cute. We’ve got a couple of bureaus, a couple of chairs and a bed. (We hope the bed doesn’t sink in the middle. We’ll do a test-sleep soon.) Plenty of space for hanging clothes and we’ll bring Ned’s uncle’s table up for a desk/dining table. Add our coffee maker, microwave and toaster oven and we’ll be in good shape. We just need some fresh water! Tomorrow I’ll start cleaning up there and my yarn will go straight up there. No sense organizing it twice! The internet was hooked up today and as soon as the electrician comes and moves the main service box onto the woodshed/future garage, we’ll move the internet to the guest house. We are making progress! We are so lucky to be able to live here and we are eager to watch the lake as it changes with the days and the months and the seasons! Now, if we could get the water pump working so I can clean up the kitchen with some warm water! And perhaps have a shower tonight!? This entry was posted in We're Here! and tagged adventure, lake house, Maine, Mainers, Messalonskee, Messalonskee Chronicles, We live in Maine, We're Here! on April 28, 2015 by lindarockwell3.